Sometimes you might want to create a form which lists the contents of one of your Data Sources. 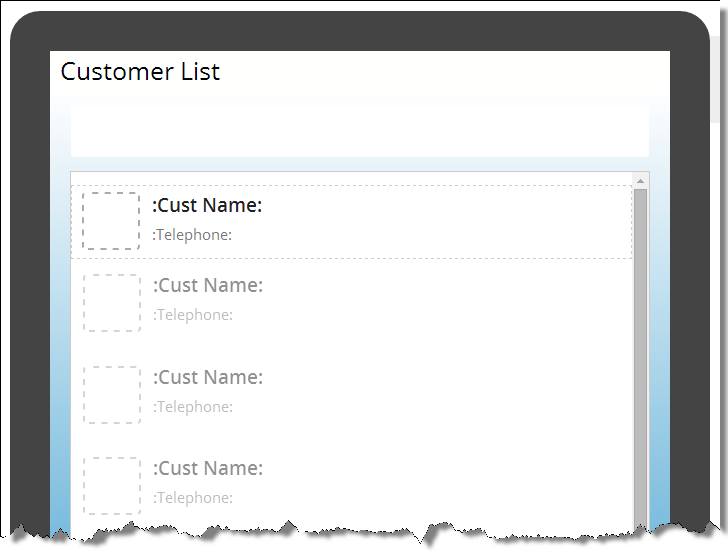 For instance, a Customer Listing screen, or a Product List screen. 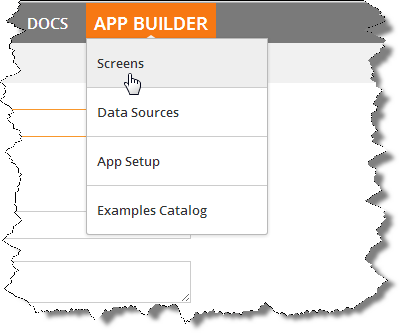 Before you start, make sure you have created your Data Source and put some data in there. 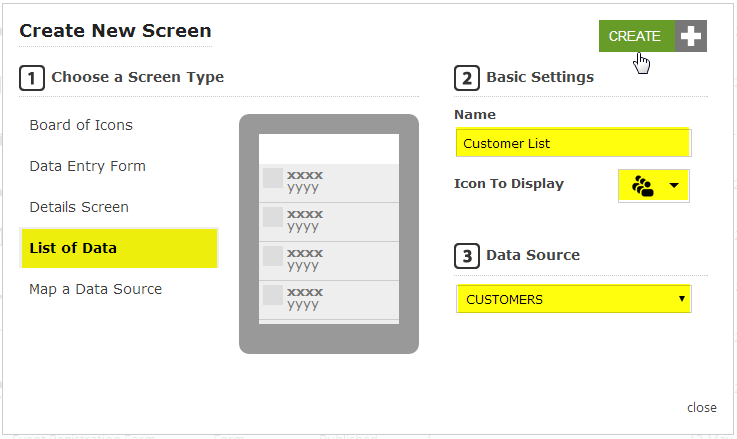 Select “List of Data” as your screen type. Then give your new screen a name and (optionally) select an icon to display on the mobile devices. Then select the Data Source you want your form to be based upon. Finally click the green CREATE button to create your form. Because this is a listing screen, each line will look the same from a layout perspective (although it will have a different customer’s data in it). So the design screen only allows you to modify the top row. The other rows will all follow suit if you change anything about the layout. So go ahead and click on the first row in the list. On the right are all the properties, similar to a when you created a Data Entry Form. But these are LAYOUT properties, so they refer to “what goes where” in your listing. 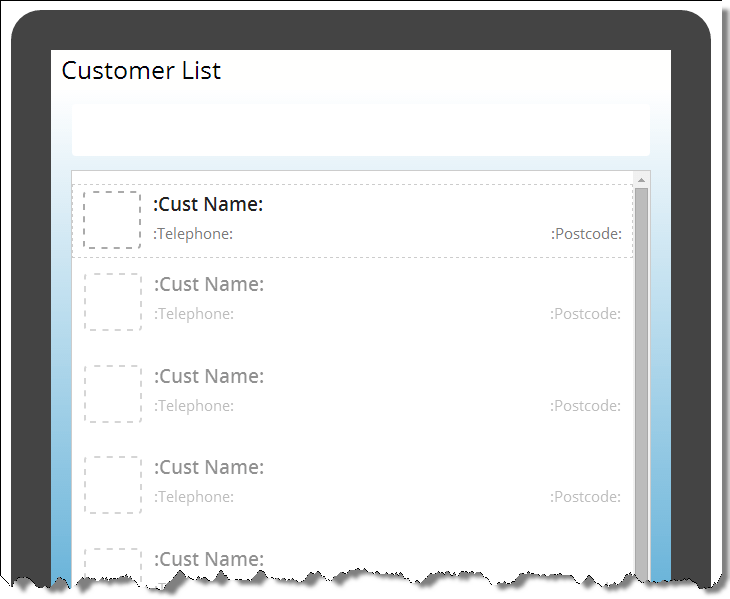 At present we’ve got the Cust Name field appearing for each customer, so you’d just get a list of customer names. Let’s add the telephone number as a subtitle for each customer, using the Subtitle Left property box. If you have an image in your data – such as a picture of your customer or an image of your product – then you can use that in the “Thumbnail” property and the pictures will display in your list screen. As usual, you can also change fonts and colours for various parts of your listing text, if you like. So there you have it. Publish your form so you can see it in action on your mobile devices! Send a Task to a Mobile User. Form Settings. Showing and Hiding Questions. Import Tasks from Excel. Login to the Mobile App. Your Finger is a Pencil. FormsFly Web Platform Gets a Facelift!. Import CSV/Excel Questions. Introduction to Forms. Create and Manage Tasks. Create a New Doc. Filter what users see on the app/platform. 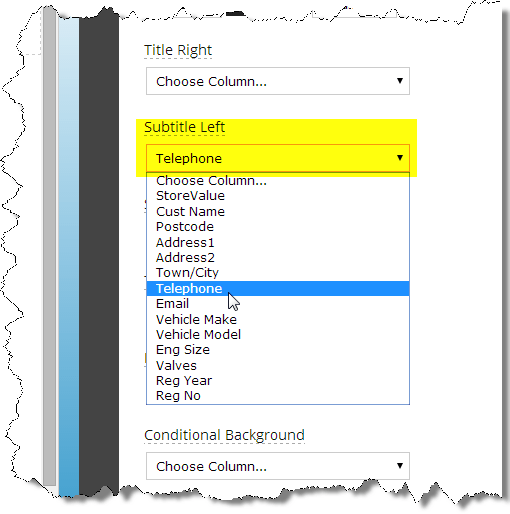 Send Form Data to a Web Service. Creating/Editing A Form. Dynamic Answers and Calculations. Dynamic Titles and Hints. Dynamic Question Features. Syncing the App. How to Login to the Platform. Edit Data Sources.